The other boys agree. Barrie sets himself up with his dog in front of the seated family. He faces his dog and says: "I want you to pay particular attention to the teeth. Some unscrupulous trainers will show you a bear whose teeth have all been pulled, while other cowards will force the brute into a muzzle. Only the true master would attempt these tricks without either measure of safety." Five-year-old Peter is not in the mood to play. Leaning toward his mother, he defiantly says: "Why did you bring me over here for? This is absurd. It's just a dog." Barrie, who was walking back to Porthos, suddenly turns around. "Just a dog?" he asks. "Just? Porthos dreams of being a bear, and you want to dash those dreams by saying he's 'just a dog'? What a horrible, candle-snuffing word. That's like saying, 'He can't climb that mountain; he's just a man.' Or, 'That's not a diamond; it's just a rock.'" Before turning back to the dog, Barrie gives the boy an appraising look and mutters, "Just." Peter retorts, skeptically: "Fine then. Turn him into a bear, if you can." Unfazed, Barrie replies: "With those eyes, my bonny lad, I'm afraid you'd never see it." The first time I saw the movie, I cried at that scene. 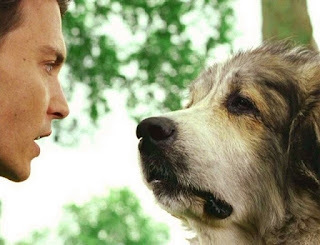 Why would a scene about a dog imagined to be a dancing bear make me cry? Because like young Peter, I had lost the wonder of being young. I was at a place in my life where I had taken on many adult responsibilities. I had allowed my grown-up challenges and relationships crowd out my sense of adventure. My ability to see the unseen was limited to the outcome of what I could only see before me, and many times I found myself visualizing disastrous results. I had forgotten what it was like to think as a child thinks, to be brave enough to imagine that I could interact in a world where Pirates and Indians were more than baseball teams, and a young hero named Peter Pan could defend me from all threats, foreign and domestic. And I wondered, who put a limit on our imaginations? At what age are we to someone dash our dreams, or use a “candle-snuffing word”? Who gives anyone the right to do that to us? And what gives us the right to do that to others? We can see how the use of imagination honors God all around us, in the words of the Psalms, the response of music and artwork, even in the way we play. Gifts that are used responsibly bring honor to the giver. “God’s gifts and his call are irrevocable.” (Romans 11:29) To snuff out someone’s imagination and dreams is to snuff out the work of the Holy Spirit in our lives. I always wondered that myself, at what age do we lose or chose to lose the the ability to think like a child or use our imagination playfully? Who says we aren't allowed to? I seem to have more fun in my "old" age when I act childish or better said, youthful. When I attended acting school, one of the very first classes, the teacher told us that a key to inter-acting with others is to think like a child. There are multiple reasons for this, but her main point was to learn to have fun like a child does and everything kinda falls into place.